Accepted Scientific Name: Melocactus zehntneri (Britton & Rose) Luetzelb. Origin and Habitat: Northeastern Brazil (Ceará, Rio Grande do Norte, Paraíba, Pernambuco, Alagoas, Sergipe, Maranhao, Tocantins and Bahia).The species has a wide range and is abundant. Altitude: 200-1000 m above sea level. Habitat: Grows in the Caatinga in a wide varieity of soil types, including soil, sand and rocks of various types, including limestone, gneiss/granite (inselbergs), sandstones, quartzitic and other crystalline formations often sit in narrow cracks of solid rook rows in dry areas where rainwater quickly disappears. The species can be very abundant, and has numerous (thousands) of subpopulations. The major threat is habitat loss due to agriculture, cattle ranching and gathering of fuel wood. Ecology: The fruit of this plant sometimes remain embedded inside the cephalium bristles, with seeds waiting, perhaps, for the parent plant to die and provide a bit of organic matter for them to germinate in their surprisingly inhospitable environments. Melocactus zehntneri (Britton & Rose) Luetzelb. 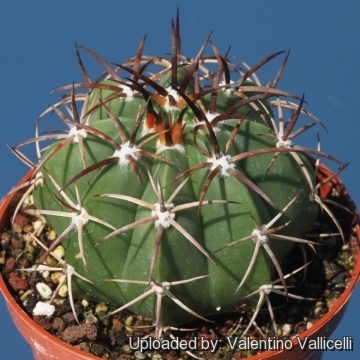 in almost all characters of Melocactus zehntneri has led to confusions in taxonomy. 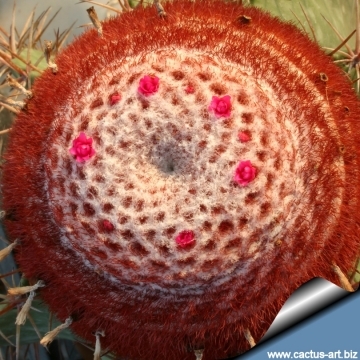 Habit: Usually stay solitary, mature plants are easily recognizable by their cephalium, that have a covering of wool and orange or red bristles, The immature plant looks like a smallish barrel cactus, and there is nothing in its appearance that would suggest a melocactus. Stem: Strongly longitudinally ribbed depressed-globose or spheroid to cylindrical, pale to dull green, often glaucous, 10-50 cm high, 9-25 cm in diameter. Ribs: 10-16 (rarely to 19) sharply acute. Cephalia: 6-11 cm or more long, 6-10 cm in diameter, with dense, fine, pale pinkish red bristles and sparse or abundant white to creamy white wool. 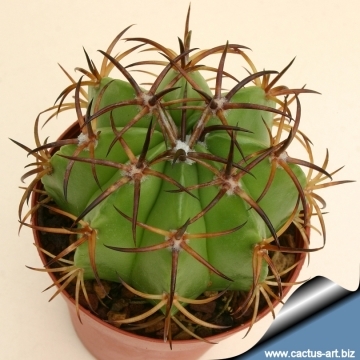 Spines: Very variable in size colour and form,rather stout, yellow, brown, or reddish, overlaid with gray except at the dark tips, sometime hooked in seedlings. Central spines: 1 to 4 (rarely absent), curved upward, 15-25(-45) mm long. Flowers: Small inconspicuous (15-25 mm long, 4-13 mm across) pale to deep or purple, self pollinating, growing more or less exerted at the top of the cephalium. Fruit: Clavate, white or pale to deep lilac-pink, 12-20 mm long 4-8 mm in diameter. Seeds: 1,2-1,3 x 1-1,1 mm noticeably tuberculate at end opposite hilum. 5) Taylor, N. P. 1991. 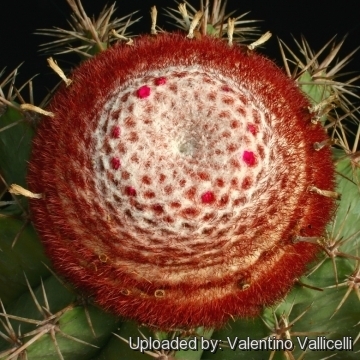 "The genus Melocactus (Cactaceae) in Central and South America." Bradleya 9: 1–80. 10) Machado, M., Taylor, N.P., Braun, P. & Zappi, D. 2013. Melocactus zehntneri. In: “IUCN 2013. IUCN Red List of Threatened Species.” Version 2013.2. <www.iucnredlist.org>. Downloaded on 04 December 2013. Cultivation and Propagation: Exclusively by Seeds. Sow in February-march in a light, sandy, porous soil. Cover germinating tray with glass to prevent seed from drying out. 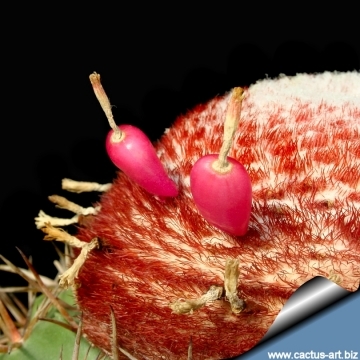 Germination is most successful at a temperature of 18 to 22° C.
Remarks: The most remarkable part of a Melocactus is its cephalium a bristle-coated structure on the summit of the plant, only Melocactus, and the similar genus Discocactus possesses this type of permanent, apical, hatlike appendage. 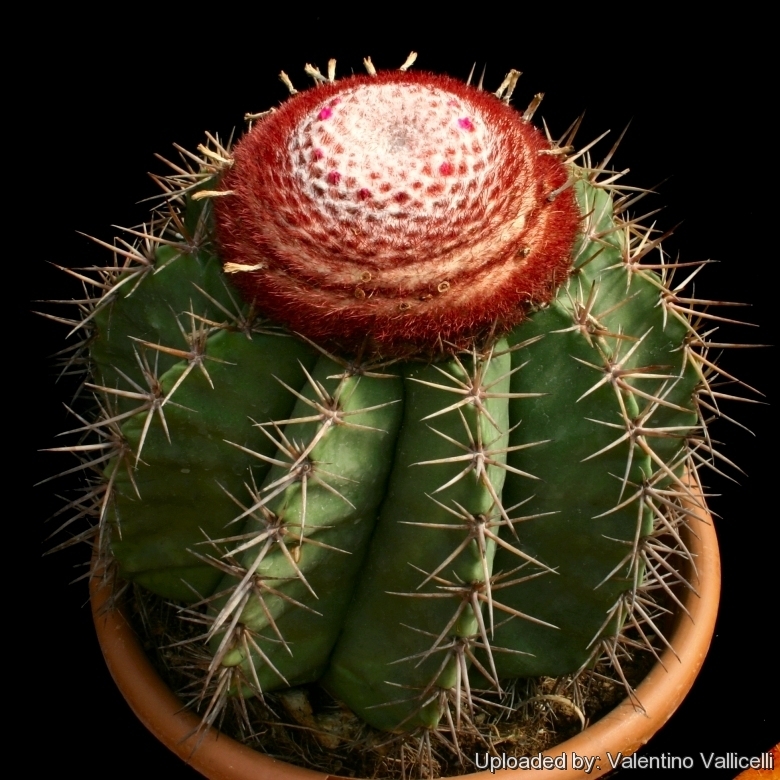 It’s only when a Melocactus reaches maturity that the cephalium begins to grow. Cylindrical, with a diameter distinctly smaller than that of the plant body below, the cephalium will keep growing for the rest of the plant’s life, but the body of the plant stops growing the moment the cephalium starts to form. . As the plants age the cephalium doesn’t increase in circumference it will steadily grow taller. Cultivation: These cacti are not the easiest things to grow and aren’t plants for beMelocactus locactus zehentneri grows from April to October, it can’t endure long stretches of total dryness, and also too much water will rot it, as its weak root systems tends to be inefficient at sucking up water from wet soil. Nonetheless, again as a result of their tropical origins, they need a fair amount of water, but allow the soil to dry quite a bit before watering again. Melocactus rests from October to April but can’t stand cold, or even fairly cool temperatures, so is indispensable to keep it above 8-12°C at all times, severe damage or death occurring at temperatures that the great majority of cacti wouldn’t mind in the least and prefer more frequent water in winter than other cacti, say once a month. Do not feed in winter. The root system is weak and generally resents being repotted and can take a long time to re-establish. The soil mix should be very quick draining, prefers very bright light, not as much as the most arid growing cacti, but plenty nonetheless.